The next recommended trail stop in Indianapolis, is the Harrison State Park golf course named The Fort. 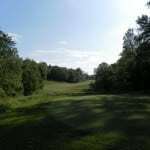 A former army base for WWI and WWII soldiers, the landscape flows from flat to rolling fairways amidst the hardwood forests, streams and ponds. The natural scenic beauty packs a powerful one-two punch when Pete adds his usual complexities of bunkering and undulations as bluebirds fly through bringing birdie luck. Forge onward to the Maple Creek Golf and Country Club, the virgin design where Pete began his career, partnering with wife Alice on this initial course, close to home. Golf pairs well with Downtown Indy which surprised the world when Super Bowl XLVI arrived. 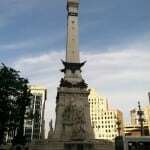 The impressive Monument Circle celebrates and honors past and present soldiers and sailors. Surrounded by blocks of serious architecture, the award winning restaurants and pubs will satisfy every taste. Start with St. Elmo’s, serving the rich and famous and you, since 1902. Try the legendary Spicy Shrimp Cocktail, with fresh horseradish sauce that will clear your sinuses. It comes with a waitress’ warning. Drown the fire with a St. Elmo’s coke -Maker’s Mark Bourbon with infused cherries and vanilla bean, a cute coke bottle on the side. For more local flavor the Slippery Noodle provides ample choices with live jazz and blues played nightly. Stay at the University Place Conference Center & Hotel on the impressive University campus and they will shuttle you back and forth. Fly into the Indianapolis International Airport which received the Leed Award recognizing exemplary design, sustainable energy efficiency, and reduced taxi times. Leave with a new sense of the great culture in this historic midwestern city. Closer to the Louisville airport on the southern end of the Pete Dye Trail is one of his most diabolical designs. The night before playing here, we had the privilege of chatting with Pete and Alice who referred to us as Danny and the other Alice. They joke easily with one another while showing mutual respect and support. Alice is very involved in the design process, especially when it comes to ladies’ tee positions. Pete said they were leaving before we played the next day so they wouldn’t hear our feedback as it is often contrary on this very difficult course. Most of the fairways are very narrow. No hole is tougher than 18 as the fairway slopes severely right to left. The greatest drives often end up in golf’s Bermuda Triangle, lost forever with heads shaking. The resort itself is iconic, a place where people flocked to s oak in the mineral spas or sun and play the casino odds. A bonus Donald Ross course here hosted the 1924 PGA championship won by Walter Hogan. It has since hosted LPGA and senior PGA events. With a $5m restoration in 2005 it is in top shape. In total there are 7 courses on the Indy trail by the master designer Pete Dye, including Mystic Hills in Culver, The Kampen Course at the Birck Boilermaker Golf Complex in Lafayette, with a natural celery bog and Plum Creek in Carmel. The latter was built for a residential area with diversification for family play with plenty of room and nice lakes. Rediscover America on The Pete dye Trail in his home state of Indiana. Check out www.visitindy.com for all the fun in Indianapolis and www.petedyegolftrail.com for Pete’s take on each course on the trail.